The second and final day of the 2016 Aussie Millions Poker Championship $2,500 Pot-Limit Omaha Event #18 saw 24 of 125 participants return to the poker room of the Crown Entertainment Complex in Melbourne. 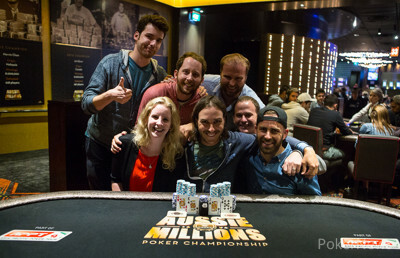 Ultimately it was Joshua Budin who emerged victorious after cutting a heads-up deal with fellow Aussie Daniel Laidlaw to claim the elusive LK Boutique championship ring and a payday of AU$64,670. Of the survivors, 50% had to leave empty-handed and among those to bust before the money were Jens Lakemeier, Michael Guttman, Konstantin Buecherl and Martin Kozlov. Start-of-the-day chip leader Tam Truong ended up as the bubble boy after getting his short stack in with pocket aces and the nut flush draw on a jack-high flop, Ilias Sagias called with the worse flush draw but made a runner-runner straight with queen-ten. 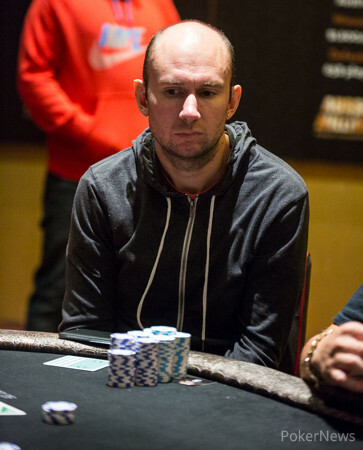 The top 12 was all Australian and Nicholas Polias, David Campbell, Michael Zowie and Buck Rabie departed before the final table of eight was set. Laidlaw started as one of the shortest stacks, but tripled up in the Rabie exit hand and suddenly took hold at the top of the counts. 2014 World Series of Poker Asia Pacific bracelet winner Sam Higgs fell in another three-way all in when his pocket nines were no good, while Billy Argyros spiked two pair with ace-queen and cracked Sagias' kings to more than double up. Sagias was the next on the rail after committing most of his stack with queen-high, Xen Xenofontos called with jacks and a wrap, ultimately completing a straight. Jarryd Godena dominated the early stages of Day 2, but ultimately had to settle for sixth place. He three-bet the pot preflop and and jammed the flop with ace-high. Budin only had a pair of sevens, but they held up and he suddenly had more than 50% of the chips in play. Argyros then lost his stack to Laidlaw, with two pair on the flop falling after a Laidlaw made a set of jacks on the turn. Nikolaos Solomos followed in fourth place after calling down three streets against Laidlaw's set of fours. 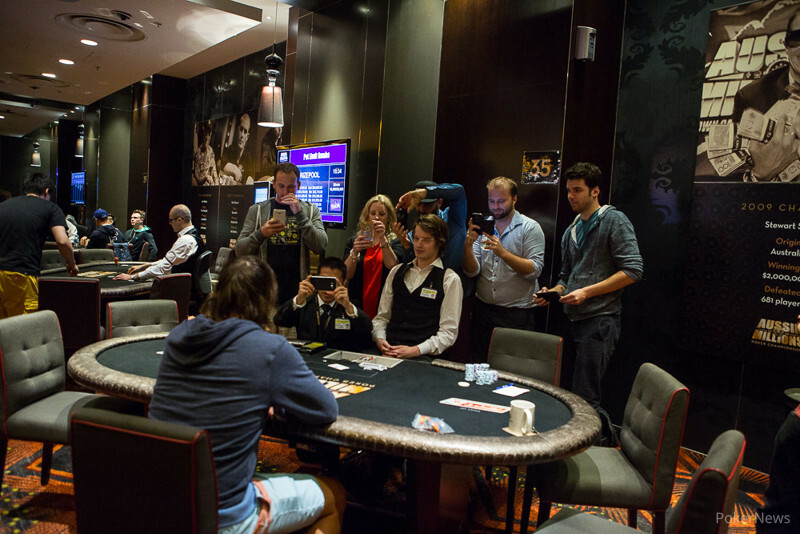 Xenofontos followed in third place with a failed bluff attempt holding sixes, after Laidlaw flopped the flush and avoided runner-runner outs. Laidlaw started heads up with a slight lead over Budin and grinded his opponent down to gain a 3-1 advantage. However, Bidun soon doubled up and they cut a deal, saving the championship ring and a small amount of cash to play for. The fireworks commenced and Bidun got there with a wrap against top two pair to claim the title. Joshua Budin pulled away slightly further and then Daniel Laidlaw raised to 60,000, Budin three-bet the pot to 180,000. Laidlaw made the call and the two of them saw the flop of . Budin continued for 360,000 and Laidlaw moved all in to receive a call for the vast majority of chips in play. The on the turn was the dream card for Budin and neither a jack, ten or eight showed up on the river, instead the river blanked. Laidlaw was covered and eliminated in 2nd place for AU$60,500 while Budin takes home AU$64,670 according to the deal. Two hands with pot-sized raises to 60,000 saw Daniel Laidlaw face aggression by Joshua Budin and he gave up both pots. The first hand was after a flop of and Budin made it 80,000, the second time it was a flop of . Half the pot was invested by each player before Laidlaw folded to a bet of 150,000 on the turn. The duo will play for the remaining AU$4,670 and the LK Boutique championship ring. Joshua Budin raised to 40,000 and Daniel Laidlaw called. On the flop, Laidlaw check-called a bet of 45,000 and then both players checked the turn and river. Laidlaw announced two pair and Budin mucked, getting shown . One hand later, Laidlaw raised to 60,000 and Budin defended. On the flop , Budin check-raised for the size of the pot and Laidlaw then pushed all in with Budin making the call. The gave Laidlaw a straight, but the river completed a flush for Budin to almost even out the stacks. The biggest pot played in the last few minutes saw Daniel Laidlaw getting paid off for 90,000 on the river. Joshua Budin had to look twice at the of his opponent before sending over the chips to the other side of the table. Joshua Budin raised to 32,000 and Daniel Laidlaw called to see a flop of . Both players checked and Laidlaw check-called a bet of 32,000 on the turn. Both then checked through the river and Budin showd for aces and deuces, Laidlaw claimed the pot with for a set. With many smaller pots, Laidlaw has pulled back into the lead. With 160,000 in the pot until the river, Joshua Budin bet 100,000 and Daniel Laidlaw called. Budin flipped over for trips fives and that scooped the pot and the chip lead.